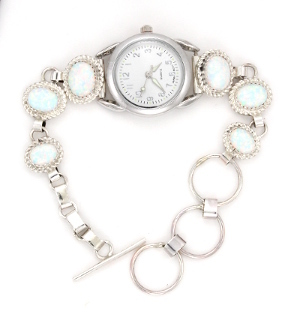 This ladies link watch has a 6x8mm, a 7x9mm and an 8x10mm synthetic white opal stone, all with twist wire borders. It measures approximately 7 3/4" long and is made by a Navajo artisan. It does have 3 loops for sizing and fits 6 to 7 1/2" wrist. Watch face may vary.